After giving a hit with crime-thriller Andhadhun, Ayushmann Khurrana is back on the silver screen with coming of age drama Badhaai Ho. The film, also starring Sanya Malhotra, Neena Gupta and Gajraj Rao, chronicles the story of a family which is dealing with an accidental pregnancy. Releasing along with Arjun Kapoor and Parineeti Namaste England, the film has a higher chance of performing better at the ticket counters. Trade analyst Girish Johar says, "Badhaai Ho is a light comedy and it has a more effective trailer. It has got the movie buffs excited for the film. So, it has a higher chance of overpowering Namaste England in terms of box office numbers. It is expected to mint Rs 6-7 crore on the day of its release." The release of Badhaai Ho and Namaste England has been shifted from Friday to Thursday to make the most out of the Dusshera holiday. Johar believes, "The partial holiday on Thursday will affect the collection of both the movies. In the end, it will all depend on the word of mouth as the audience now no longer is driven by star power. They prefer content over the actors in a movie." 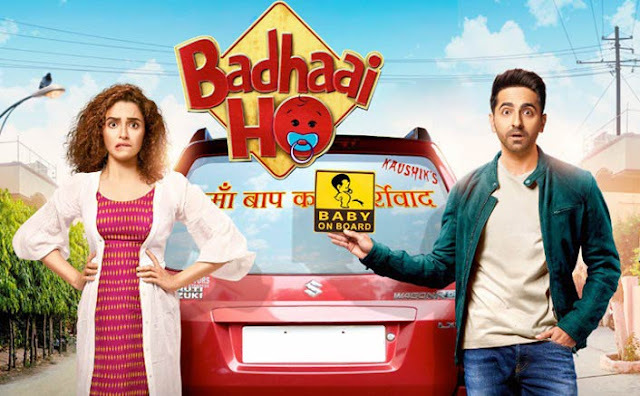 Talking about Badhaai Ho, director Ravindernath told us, "I always wanted to make a comedy film. However, the thought was to make a film based on situational comedy. You must have got an idea with the trailer. We have not written a single dialogue in an effort to make the audience laugh. They will crack up because the situations will be such."